Dèesse Magazine: Effortless Summer Beauty .. From Start to Finish ! Effortless Summer Beauty .. From Start to Finish ! Isn't my J.Crew ring just darling ? 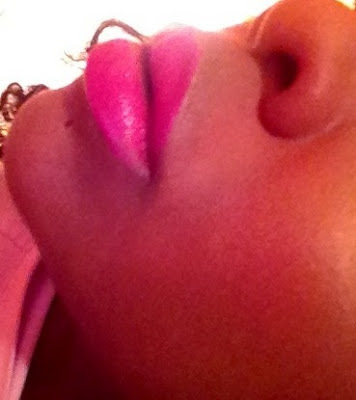 Flawless Complexion and Fuchsia Lips ! I decided to go through a fast forward approach to looking your absolute best this summer. Keeping it simple - a bold lip and a flawless complexion ... nothing MORE, nothing LESS! Although the impending Summer season is here and perhaps products we use may change due to the heat, one thing that remains the same is "technique" - Rickycare 3D Blenders (Rickys NYC Stores , Rickysnyc.com / $8.00 each ) aid in flawless application . No matter the season ( Summer , Spring , Fall or Winter) , we STILL have to make sure we BLEND! BLEND! BLEND! These application sponges are super soft and durable and just as great to use as more pricier versions on the market right now. You can buy all three Blenders for the price of 1 ! I live for a bargain . I like to use the smaller blender sponge for concealer, the dual tip as well as the original sponge shape for foundation / CC Creams. The dual tip is great for when you want to get in hard to reach corners like the eyes / nose , etc.. Speaking of CC Creams. I am loving the new CC Cream Broad Spectrum SPF 40 in Dark (Pür Minerals / $38.00). The texture of this CC Cream has like a "whipped" feeling ( in my opinion) , and it also goes on like a full coverage foundation. You really can wear this alone without traditional foundation / powder. My favorite aspect about this CC Cream is the SPF 40 , no other CC or BB Cream has this high a level of Sun Protection - it really sets this product apart. I just dab a little on my 3D Blender sponge and blend away. As displayed in the photos above ( taken with my phone , sorry if they're not that clear) - flawless finish!! Summer is about BRIGHT colors ! From clothing , decor to makeup.. Bright lips are the perfect way to stay "on trend". For lips that scream "Hot Pink Paradise" like my lips above, Makeup Artist Mally Roncal suggest The Perfect Bright Lip Kit in Frisky Fuschia (Mallybeauty.com / $26) . This set comes with a liner to line the lips along with a 7-in-1 Lip Magnifier that combines a smoother, treatment, hydrator, primer, pencil, color, and gloss all in one package. BONUS : Fuchsia lips also makes your teeth appear whiter ! Honorable Mention - My 24K Gold nails ( pictured, above) are puuurrrrfect for the summer ! I am wearing ZOYA Nail Lacquer Pixie Dust in "Solange" (zoya.com / $9) from the Summer 2013 collection. This texture is like no other , if you have not gotten sprinkled by the Pixie Fairies at Zoya yet, please do yourself a favor and head over to Zoya.com and grab the collection !